Cross the Golden Gate Bridge and drive north. 100 miles later you find yourself in the quiet old mill town of Annapolis, two hours and a world away from the international city spectacle that is San Francisco. Set back from the coast, away from California State Highway 1 and the tourist traffic which streams up and down it, Annapolis is a town that has about as much in common culturally with San Francisco as it does with Berlin—that is to say, not much. Hunting, fishing, mushroom picking, and pot gardening supplement the local economy and social hour conversations often return to the backwardness of Sacramento and Washington D.C. laws and regulations which seem to fit the tastes of an urban population more than the needs of rural people still trying to make a living off of the land. Annapolis sits surrounded by steep sloped hills alternately cloaked with dense scrub, redwood, Douglas fir, and tanoak forests. Trees have been the heart of the town’s economy since its inception. The town’s first European-American settlers planted apple orchards, drying and shipping the fruit back to the eastern United States. Paired with the fruit trees was the tanoak bark industry. Annapolis is full of tanoak trees (Notholithocarpus densiflorus) which get their name from the high concentration of tannins in the bark. Tanoak bark was the mainstay of the leather tanning industry in the late 1800’s when Annapolis was established. Bark would be chopped off standing old growth trees and hauled out of the woods by horse drawn wagons. Amazingly, when some old time locals bought land that was mostly inland redwood, people laughed at them and said “there’s no tanoak on that land”. The tanoak bark industry dwindled in the early 1900’s but in the middle of the twentieth century, Annapolis became a logging and mill town, growing with the boom in redwood logging which ultimately saw the destruction of all but a handful of old growth stands of these iconic trees found nowhere else in the world. With the liquidation of the old growth and increase in environmental regulations the local timber industry collapsed in the 1990’s. The lumber mill closed over a decade ago, leaving the town in a state of transition again, now away from forestry. Compared to its heyday, the town looks empty, comprised now mainly of people content to make a living doing odd jobs and eking out an existence in a backwater of our world’s globalized economy, along with a smattering of wealthy Californian’s from elsewhere looking for an escape from urban life. Perhaps the most dangerous time for felling large trees, as the tree begins to lean as the back cut approaches the face cut. Josh prepares to step away quickly. Amidst this change, Rogers and Son Forest Products has built a small 21st Century timber business based in Annapolis, diversified to meet the demands and resources available in the modern world. Specializing in small and custom jobs, Rogers and Son is known for the high quality of their work. 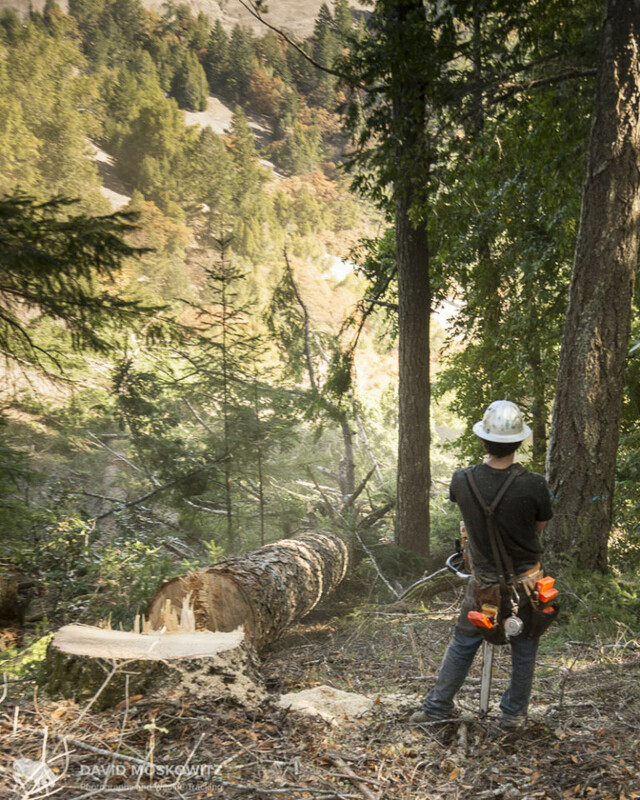 Their projects span from small-scale timber harvest to forest road repairs for salmon habitat restoration, to firewood production. They do business in redwood burls, going into cut over lands and pulling out the massive oddly shaped stumps and shipping them off around the world where manufactures produce things such as dashboards for Rolls Royce, guitars, furniture and many other specialty items. Tanoak stands become firewood bundles purchased for $5 on the side of the road on the way to a family camping destinations along the coast. Tall straight-grained Douglas firs are trucked down to the port in Oakland where they are shipped out raw across the Pacific to Asia. Single redwood logs are custom harvested, delivered and installed for high-end landscaping and construction projects for wealthy Californians on the coast. You won’t find them on the internet. The company doesn’t have a website, succeeding on word of mouth jobs and the shrewd business sense of owner Darrel Rogers. Regardless of the novel products and destinations the 21st century requires for a forestry company, the ongoing infatuation people have with wood products means that there is still work to be had in the woods around Annapolis for at least a few folks cutting trees. On a warm fall afternoon we joined timber feller Josh Spacek, and watched him drop 150 foot Douglas firs on a forested ranch just outside of Annapolis. Josh was born and raised in this part of rural California. His grandfather was a logger and mill owner north of Annapolis in the coastal town of Manchester. His family emigrated from Wisconsin where some of the last big tree logging in the eastern United States happened. As the primevil forests of the upper Great Lakes disappeared, many logging families came to California for the promise of work in the logging camps. Josh loves these hills. He’s an avid deer hunter and steelhead fisherman. As tough as he is, he’ll leave a tree he’s supposed to cut if he sees a bird nest with eggs in it. He’s been falling timber for over a decade and before that he was a tree climber and trimmer. Now he’s known for being the best man to take down dangerous, difficult, and really big trees. He’s also a father of three little ones. Running the saw blade down the trunk to save the energy of having to carry it. Behind him, Josh is running out a tape measure to determine where to section the trunk. "Bucking the tree". Careful not to pinch his saw blade, Josh cuts the trunk into sections for transport. While laws, ethics, and tools have evolved over the generations, its not just people’s love of wood products that persists but also the love and desire of some of us to work in the woods, carrying on a tradition that goes back thousands of years to the stone age, when humans hafted stone tools and employed careful burning to bring down big trees. Then as now, these trees produced everything from cooking utensils to homes. As Josh walks into the woods, a three-foot bar chainsaw over his shoulder and dog on his heels, behind him are generations of woods workers who did the same. What lies ahead for this profession is as uncertain as the future of towns like Annapolis. David Moskowitzis a photographer and biologist based in north-central Washington. He is the author and photographer of two books, Wolves in the Land of Salmon and Wildlife of the Pacific Northwest. Matt Nelson is a lifetime resident of Annapolis. He works in the logging and construction fields as well as in outdoor education, and wildlife conservation and research. The whole process of gunning, felling, limbing and bucking the trunk took Josh about 15 minutes for this tree. Josh's dog Sis wanders the woods during the day while Josh fells trees.